Being a professional stylist I always stress to my clients about how using professional products will give them better results and keep their hair healthy. I strongly know and believe in this, not to earn a commission, but to keep my clients hair healthy. Stylist can be like doctors for your hair, and it’s important to us to keep everyone’s hair healthy. With that said, there are amazing products for half the price of professional products that will give you beautiful results. Professional shampoo and conditioner can get a little pricey. Just because you want to spend a little less money, doesn’t mean there aren’t hair products that can do an awesome job that cost a little less. 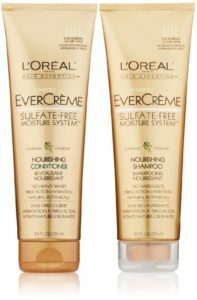 If you need to pick up something from your local drug store/grocery store my absolute number 1 recommendation is L’Oreal EverCreme Sulfate-free shampoos and conditioners. L’Oreal has been around since 1909! They know their stuff. 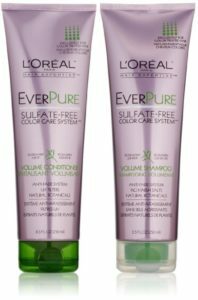 L’Oreal has a professional line that is sold only in salons, but the L’Oreal you see in stores is well made, and well trusted. When you want to splurge on hair product from salons go for it. But if you just want to grab something without breaking the bank check out L’Oreal EverCreme. Comes in a variety of choices: Thickening, Moisture, Volume, Smoothing and many more! 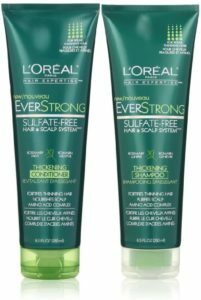 For more information on other shampoos and conditioners check out Best Shampoo and Conditioner For Dry Hair , Best Shampoo and Conditioner For Fine Hair.